The Yard-Man 28 Inch Snow Blower is a self propelled snowblower that is powered by a 4 stroke, Yard-man designed and built engine. This engine has a displacement of 0.36 liters. As this Yard-Man engine is a 4 stroke, it means that you never need to mix the oil and fuel yourself. Instead, you just need to add them separately to the machine and then the engine will mix them itself. To start the engine you just need to plug it in to the nearest power supply and simply press the 120 volt electric starter button (the easy option). However if you are not close to a power source, you can instead use the recoil, pull cord starting system. The fuel tank on the Yard-Man 28 Inch Snow Blower has a fuel tank capable of holding up to 4.73 liters of gasoline which is enough to enable the machine to go on operating non stop for over 2 hours before you’ll need to refill it. Power from the engine gets to the wheels via a gear box that gives the snowblower 6 gears when traveling forward and 2 gears when it’s reversing. To prevent this dual stage snowblower from slipping during operation, it uses Snow Hog wheels to strongly grip the surface it’s traveling over. These tires are very wide with a width of 0.12 m (4.8 inches) and a diameter of 0.41 m (16 inches). Obviously the clearing width of this machine stands at 0.71 m (28 inches) while it’s intake height is comes in at 0.53 m (21 inches). After the snow is initially broken up and then passed through the impeller where it’s further broken up, it passes through the chute as it is fired away from the machine. The chute is made from a plastic polymer which means that it is less likely to get blocked when compared to a metal chute of the same size. The chute is capable of turning up to 200 degrees. 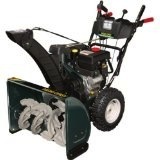 Click Here to buy the Yard-Man 28 Inch Snow Thrower.